Joe Curtis is keen to seize his opportunity after enduring a game of patience at AFC Rushden & Diamonds this season. The midfielder, who joined Diamonds at the start of the 2016-17 campaign and played a role in helping the club win promotion to Step 3 last season, had ankle surgery last summer. 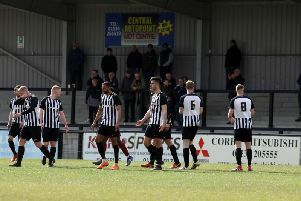 It resulted in him missing pre-season and the start of the current campaign as Diamonds moved up to the Evo-Stik League South Premier Division Central. Having recovered from the operation, Curtis returned to action in September as he made the first of eight appearances for Rushden & Higham United in Division One of the Future Lions United Counties League after joining the Lankies on a dual registration in a bid to regain his match fitness. Since then, it has been a waiting game for the midfielder mainly due to the fact that Diamonds had enjoyed such good form since gaining promotion. But his chance arrived as he was handed his first start of the season in the 3-1 victory at Bedworth United and he kept his place for the 1-1 draw with Banbury United at Hayden Road last weekend. And, as Diamonds prepare for a trip to Rushall Olympic this weekend, Curtis is hoping he can continue to perform well and keep his place in the starting 11. “We have got a good squad,” the combative midfielder said. “There’s people on the bench who have been in and out and I am fortunate to have come back into the team at Bedworth and I kept my place for the Banbury game. Hopefully I can keep it for the next one. “I had surgery over the summer and I missed pre-season and the start of the season itself. few months to get my chance but that is only because the lads in midfield had done so well. “I couldn’t really go and bang on the manager’s door and ask why I wasn’t playing because everyone in the team was doing well. Despite last weekend’s stalemate with Banbury, Diamonds are still in what continues to be a tight race for the play-off places after a fine run of form that has seen them lose just twice in their last 15 matches. And Curtis insists he and his team-mates are enjoying the ride after making a big impact following their promotion last season. “I think everyone believes we are overachieving at the moment,” he added. “No-one expected us to be doing as well as we are and we are enjoying it. “It’s nice to be in and around there and there are a lot of other teams in there with us. “But if we keep taking it a game at a time then I think we can be there at the end."